As Pike County Common Pleas Judge Randy Dearing reads the indictment against him, George “Billy” Wagner leans over to consult with one of his attorneys. George Wagner III enters Pike County Common Pleas Court for arraignment on 22 indictments, including eight aggravated murder charges. 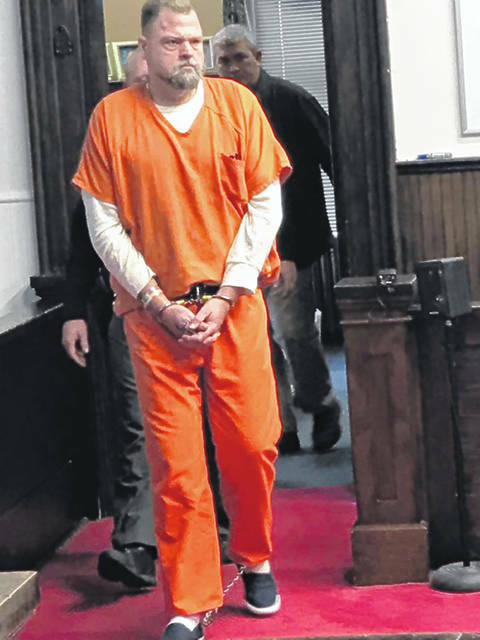 On Tuesday, George Washington “Billy” Wagner III became the sixth and last member of his immediate family to face an arraignment before Pike County Common Pleas Judge Randy Deering in connection with the murder of six members of the Rhoden family in April 2016. During the past two weeks the four persons charged directly with the Rhoden murders, including George Wagner III’s wife Angela Wagner and two sons, Edward “Jake” Wagner and George Wagner IV, who all have appeared before Deering. Except for Edward Wagner, who faces an additional count of sexual contact with a minor, all of the Wagners face 22 felony counts, including six counts of aggravated murder, one for each victim of the Rhoden massacre. As has been heavily reported, each of the murder counts carries with it death penalty specifications. During his arraignment, as was the other suspects during their turns in front of Deering, family patriarch George Wagner III was mostly silent, answering only simple “yes” or “no” questions from the judge. Just as he did with the other three key suspects, Deering read the entire long indictment against George Wagner III, who immediately pleaded not guilty to all 22 counts against him. As he did with the other Wagner suspects charged directly with the murders, Pike County Prosecutor Rob Junk asked the suspect to be held with no bail. George Wagner III’s attorneys offered no argument for bail and Deering granted Junk’s request. Wagner III presumably was returned to incarceration in Butler County. Again, as did the other three key suspects, George Wagner III waived his right to a speedy trial. One of his attorneys stated considering the severity of the charges and the complexity of the case, doing so was in the suspect’s best interest. Junk did not object and Deering granted the waiver. Deering also extended the gag order put in place during the other arraignments, a gag order which prevents any official connected with the case on either side from speaking with the media. 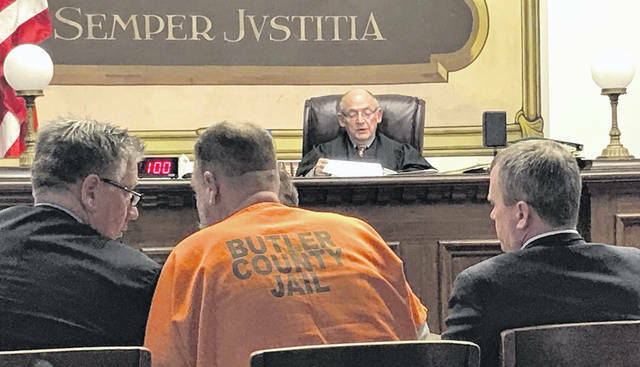 Prior to imposition of the gag order, Wagner III’s attorney widely was quoted as saying he would seek a change in venue, moving the case out of Pike County. No such motion was made Tuesday, but it still may be on the way. Like most of the rest of his immediate family Wagner III will spend the coming holidays behind bars but will return to court for a pretrial hearing 1:30 p.m. Jan. 17. In speaking to the Daily Times on death penalty cases in general, The Ohio State University law professor Douglas Berman, advertised by OSU as an expert in the death penalty, said in addition to having to be found guilty of aggravated murder, in order to face the death penalty, capital suspects must be found guilty of at least one of 10 death penalty specifications or aggravating factors. As spelled out in the indictment against George Wagner III and the other three murder suspects and as read into the record by Deering during their arraignments, the death penalty specifications against the Wagners are committing an aggravated murder to cover up another alleged crime; committing aggravated murder as part of a course of conduct involving the purposeful killing or attempt to kill two or more persons; and, committing aggravated murder after committing or attempting to commit aggravated burglary and either the suspect was the principal offender in the commission of the aggravated murder or if not the principal offender, committed the aggravated murder with prior calculation and design. Each primary suspect in the Rhoden murders also face multiple charges of burglary as prosecutors charge the suspects broke into the Rhoden homes in order to commit the murders. Two non-murder suspects in the Rhoden case were arraigned Nov. 14 and are currently free on bail, though each are also under electronically monitored house arrest and barred from any contact with the families of the victims. Grandmothers in the Wagner family, Fredericka Wagner, 76, and Rita Newcomb, 65, both pleaded not guilty during their arraignments. https://www.portsmouth-dailytimes.com/wp-content/uploads/sites/28/2018/12/web1_wagner-judge.jpgAs Pike County Common Pleas Judge Randy Dearing reads the indictment against him, George “Billy” Wagner leans over to consult with one of his attorneys. https://www.portsmouth-dailytimes.com/wp-content/uploads/sites/28/2018/12/web1_GeorgeWagner_ne20181241463839-1.jpgGeorge Wagner III enters Pike County Common Pleas Court for arraignment on 22 indictments, including eight aggravated murder charges.